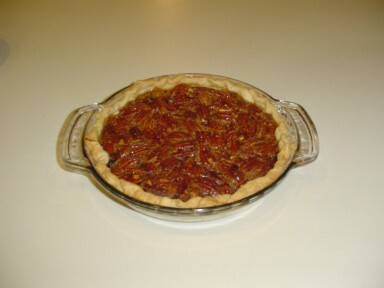 My famous pecan pies are done and ready to take to my son’s. He’s doing all the hard stuff, and for that I am very thankful. Combine syrup, sugar, eggs, vanilla, & salt. Mix well. Add pecans and coat well. Pour into an unbaked 8” pie shell. Bake in a moderate oven (350 degrees F.) for 50 minutes or until crust is browned. Note: this pie absolutely must be served warm, but not too hot. If you still have some the next day, please do yourself a favor and warm it again, so that the crust will be flaky and not soggy. Of course you can top it with whipped cream or ice cream, but I think that’s taking things a little too far. It’s so good by itself! On the individual basis, gratefulness gives us peace of mind and contentment. With this, our stress level is reduced which in turn keeps us happy. Martha, it looks yummy, sounds easy, but you lost me at corn syrup, and then, of course, there’s the crust itself. Have a wonderful Thanksgiving weekend with your family.